Los Cabos is famous for its beaches, ocean views, and the dramatic arch at the southern tip of its Peninsula. But Cabo is also part of the Baja desert landscape which is also known for its impressive sand dunes. Smooth curves, striking shadows, intricate patterns, and dynamic shapes make sand dunes visually stunning, and a great alternative to the beach for an environmental portrait. This couple wanted to do something different for their day-after bride + groom session and were up for getting the wind in their hair and sand between their toes. The day after their wedding, during which they wanted to spend the majority of their time with their guests, they wanted to spend some quality time together and create some art portraits in their wedding outfits. We did a little off-roading and exploring in our Jeep to find the perfect sand dunes surrounded by acres of cacti on one side and the Pacific ocean on the other. 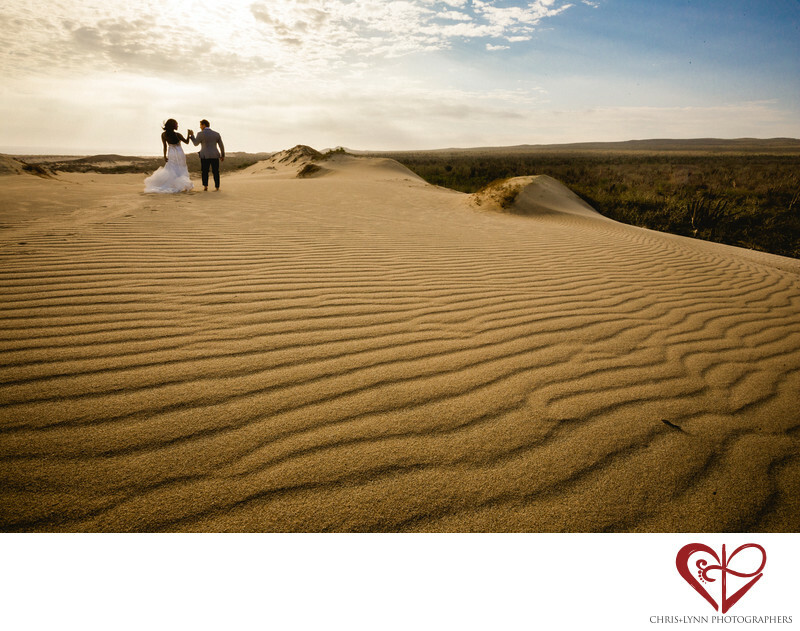 Though the sun was bright, the wind kept the couple cool as they wandered through the sand together reminiscing about their first visit to Mexico. Many of our couples tell us they have so much fun doing portraits the day after the wedding because they can relax, focus fully on each other, and all their stress is gone! For this image, we used the Canon 16-35mm wide angle lens from a low angle to emphasize the expanse and patterns of the sand. Location: Cabo San Lucas, BCS, Mexico. 1/200; f/22.0; ISO 400; 16.0 mm.